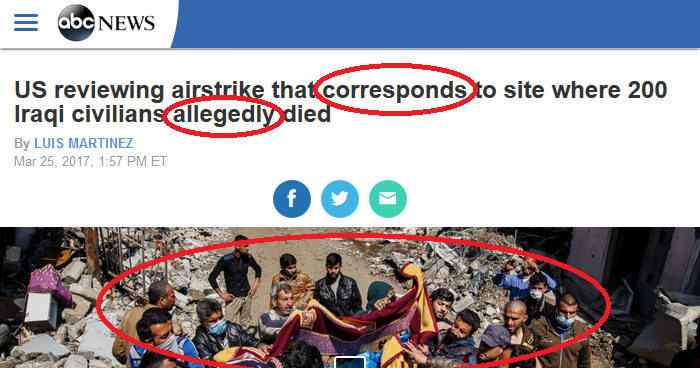 If you read the headlines of major corporate media outlets, you’d think hundreds of Iraqi civilians in Mosul coincidentally died in the same location that just so happened to be hit by a US airstrike. 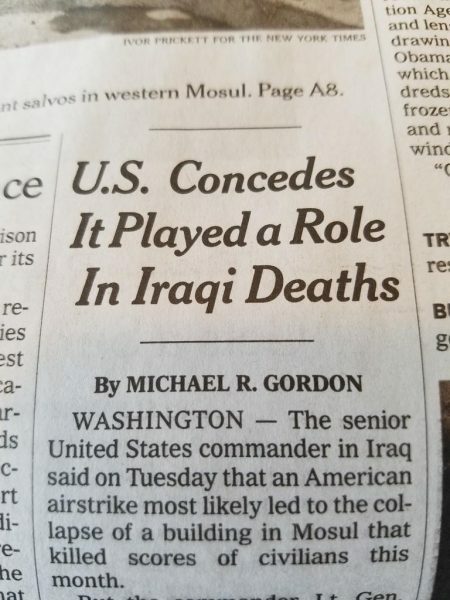 Note that the Iraqis simply died; they weren’t killed. The airstrike was a mere temporal and geographic coincidence. The Los Angeles Times (3/25/17?) 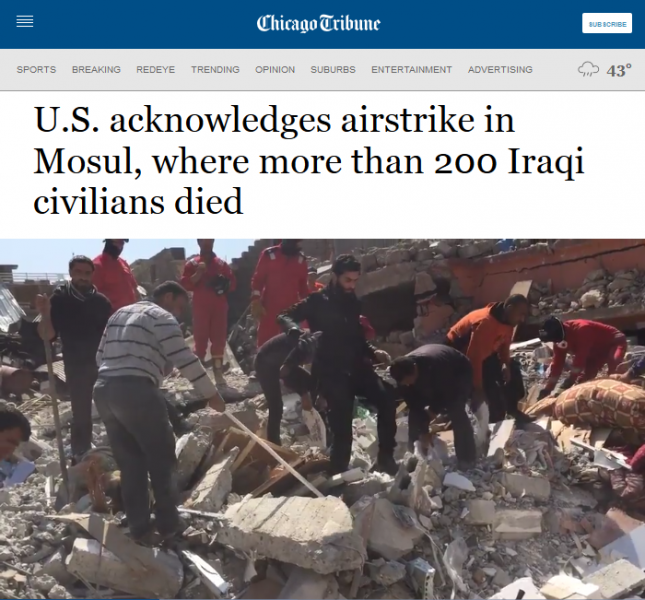 used similarly obfuscatory language, with the headline “US Acknowledges Airstrike in Mosul, Where More Than 200 Iraqi Civilians Died.” This article, which was republished by the Chicago Tribune (3/25/17), made it sound like 200 Iraqis have been killed in all of Mosul. Headlines are the most important part of news articles; they greatly influence what the public thinks about political issues. In fact, studies show that most Americans don’t read beyond headlines. These latest whitewashed titles are remarkably reminiscent of those composed to cover (up) a previous high-profile US massacre of civilians: the October 2015 US bombing of a Doctors Without Borders–operated hospital in Kunduz, Afghanistan (FAIR.org, 10/5/17). The New York Times published a masterpiece of propaganda with the headline “US Is Blamed After Bombs Hit Afghan Hospital.” Ambiguous language, heavy use of the passive voice and awkward wording abounded. Later, when the commander of the US-led task force fighting ISIS tepidly admitted, “My initial assessment is that we probably had a role in these casualties [in Mosul],” slightly more direct reports slowly came trickling out. But even after the dust settled and the facts became clearer, media continued to downplay their severity. What was that role, exactly? Well, carrying out the airstrike that killed them. But let’s not split hairs. While major corporate media largely echoed the US government line, independent left-wing news outlets, on the other hand, were immediately much more straightforward in their reporting. “With 200+ Iraqi Civilians Feared Dead, Carnage Surging Under Trump,” wrote Common Dreams (3/26/17? ), for instance. Given the extreme brutality of ISIS, a genocidal Salafi jihadist group that has slaughtered civilians from religious and ethnic minority groups in Iraq and Syria, it is perhaps understandable that much of the media attention is on its crimes. But the atrocities committed by the forces fighting it cannot be ignored. Such an approach is a recipe for disaster, as the so-called Islamic State has demonstrated a tendency to exploit Western atrocities for propaganda and recruitment. Little ink has been spilled in the US media for those victims, nonetheless. According to the monitoring group Airwars, as many as 1,000 civilians were killed by US-led coalition actions in Iraq and Syria just in the month of March (Democracy Now!, 3/27/17). 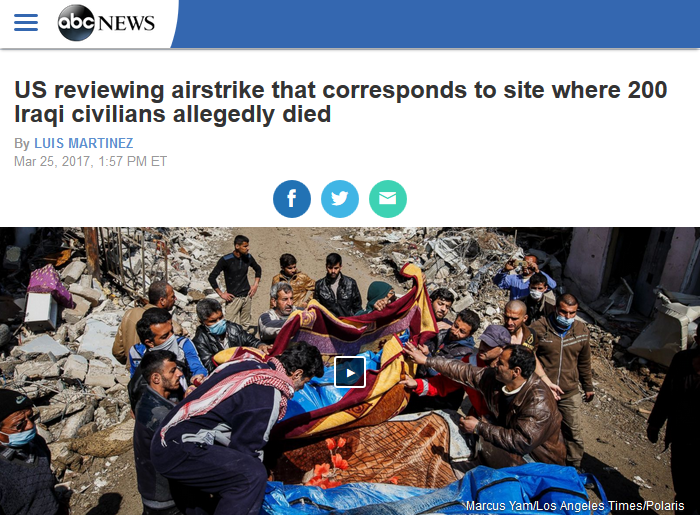 Many more civilians have been killed in the past two years (Intercept, 8/3/15), yet their deaths have received little attention by major corporate news networks, even when they may help fuel the very extremist group whose monstrousness was used to justify them. In fact, the US dropped more than 12,000 bombs on Iraq (and another 12,000 on Syria) in 2016 alone, with little media scrutiny. There was no real public discussion, let alone political debate, about whether or not US bombing ISIS would be a good idea, not to mention whether or not Western airstrikes can actually defeat a guerilla extremist group like ISIS (Extra!, 11/14). After all, it was the illegal US-led invasion and subsequent decade-long military occupation of Iraq, in addition to intervention in the war in Syria, that led to the rise of the hyper-sectarian Islamic State in the first place. Defenders of corporate media might argue that news outlets had to craft carefully worded headlines as the US government was still investigating the attack. But again, this simply reflects media’s deference to power. If the government says something, there are countless journalists waiting in line to obediently echo it. Corporate media have a long, tried-and-true history of acting as stenographers to power. A quick look at other instances in which media employ this kind of euphemistic language is instructive. These whitewashing tools are reserved almost exclusively for reports on the crimes of those in power. Police frequently benefit from this linguistic sleight-of-hand. When cops shoot and kill unarmed civilians, the deaths are referred to as “officer-involved shootings” (FAIR, 7/11/16). A crutch is made out of the passive voice. Cops don’t fire their guns and shoot people; their guns are magically “discharged,” as if of their own accord. “Alleged” is ubiquitous and abused: Police “allegedly” shot someone, media insist, even when there is video of the cops shooting them. These tricks are employed even more frequently, and egregiously, in reports on atrocities committed by the US and its allies. And while media outlets invariably give the US the benefit of the doubt, Western enemies are not afforded the same luxury. 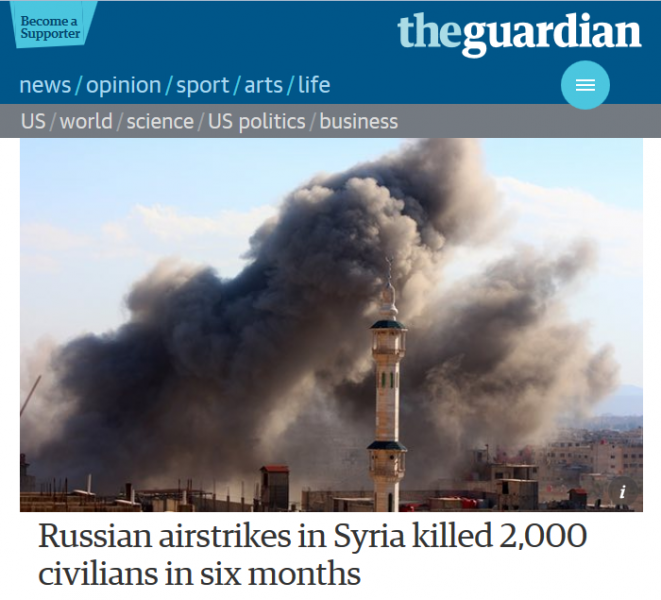 In Syria, for instance, civilian casualty estimates after airstrikes carried out by the Syrian government and Russia are reported exclusively based on the accounts of rebels and “activists,” some of whom have received extensive support from foreign countries committed to overthrowing the Syrian government (AP, 11/29/15, 4/28/16, 11/19/16; Reuters, 1/11/16; CNN, 9/26/16). The incredulity exhibited in the reports on the US attack in Mosul starkly contrasts with the dogmatic certitude reflected in the incessant barrage of thinly sourced stories on Syria, Russia, North Korea, Iran, Cuba, Venezuela, China and beyond. This is how US media operate: Staunch skepticism is reserved for reports on the crimes of the US and its allies, whereas rumors and myths are reported as facts when they shine negatively on enemy governments. NextDoes It Bother You That 3,330 Humans Were Killed In Iraq During March?